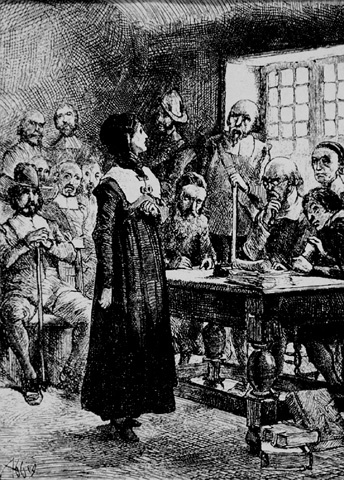 Allow me one more post on this last day of Women's History Month about Anne Hutchinson, the midwife in the Massachusetts Bay Colony who was banished to Rhode Island for heresy. The pregnancy Hutchinson had been carrying during her civil and ecclesiastical trials turned out to have been probably the first hydatidiform mole, or molar pregnancy, in New England, according to a 1959 article in the New England Journal of Medicine. This freakish obstetrical event, which occurs in about 1 in 2,000 pregnancies in the United States today (it is 10 times more common in Asia), happens when a pregnancy goes awry and turns into a mass of tissue in the uterus. The mass might grow for several months, and lumps of tissue might eventually be "delivered." Such a "birth" event would likely be upsetting to anyone, but given the beliefs of the time, it carried a dark judgment on Hutchinson's state of grace. She was safe in Rhode Island, but the event was sensational news. Imagine the response of her nemesis, Gov. John Winthop of the Massachusetts Bay Colony, when he heard that not only had Hutchinson attended Mary Dyer's "monstrous birth," but now had also delivered one of her own. I can't stop wondering how Hutchinson felt about this. Although the austere religion practiced in the Massachusetts Bay Colony never allowed anyone to take salvation for granted, according to Calvinism, God's favorite people should be easy to spot: They prospered in this life as well as the next. Hutchinson herself had had a comfortable life in England, and even in Massachusetts she was a member of the church, the wife of a prosperous textile manufacturer and the mistress of an elegant home right across the road from Gov. Winthrop's, according to Selma R. Williams in Divine Rebel: The Life of Anne Marbury Hutchinson. Yet her life in America was one catastrophe after another. Hutchinson was a deeply religious woman. Did she feel God's presence so strongly that she was able to dismiss the evidence others saw of His disfavor? Or was she constitutionally unable to listen to people she judged unlikely conduits of the word of God? In any event, she spoke her mind, she stood for what she believed in, and she moved us all forward.